Free off-street parking that abuts the public realm: The enemy of walkability. When I was a reporter, I often covered stories about suburbs working to revitalize their downtowns. In one of those communities, downtown consisted of about a block and a half of walkable, mixed-use development surrounded by acres and acres of parking. Today, though, I think the village official was partially correct and partially off the mark. That suburb, like our neighborhood, doesn’t have “a walking problem,” it has a “walkability problem.” In planning sessions, residents made their voices clear that they wanted a walkable downtown — they just didn’t have one. If you couldn’t park within one block of the businesses you wanted to visit, your walk was pretty dull. You were only surrounded by more parking lots rather than interesting sights, such as other businesses. “The distance people are willing to walk (without complaining) is commensurate to the quality of place they’re walking to. And the experience of that walk should be a pleasant and safe one. The more things to see, do, and experience (as well as meet others), the more people are compelled to walk further. Even if there is no particular destination in mind. A city should be designed in a way where the ‘stroll’ is the destination and experience in and of itself. For all the concerns I hear about parking in Beverly and surrounding neighborhoods, we seem to have an abundance of it — on-street and off-street, paid and free, public and private. Just walk around at any time on any given day and see how many spaces are open, both on the street and in our many lots (don’t forget that despite our cul-de-sacs, some side-street parking is open to non-residents). Here’s a look at 95th Street from the air. Click to view this in Google Maps for more detail. And here is the same view with off-street parking highlighted in green. Pardon my crude Photoshop job. Click to see this larger. Consider how much of it faces the public realm and then think about Kennedy’s message. Does this make for a pleasurable walk? Also consider how much of this parking is reserved for specific businesses (and Metra). That all but guarantees that drivers who park in this area will not be patronizing any other shops. 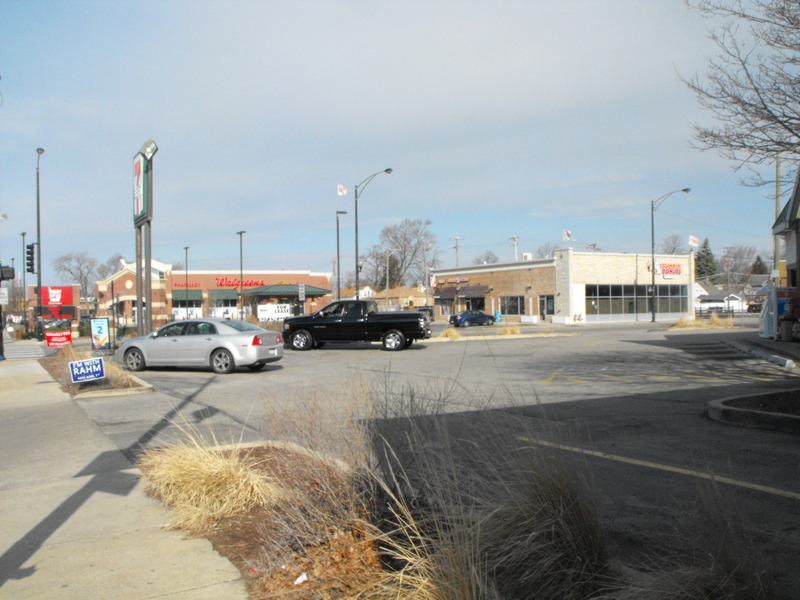 This is the argument I made about the massive Walgreens parking lot in Mount Greenwood. Not only are we incentivizing driving to the area at the expense of our public realm, we are ensuring that only certain businesses benefit from that incentive. In fact, most of our commercial corridors are zoned in a way that requires developers to build off-street parking for specific amounts of retail and residential space. So we have a ton of parking, perceptions of a parking problem and a lack of walking. What do we do? Well, if we want to follow the lead of that suburb I mentioned above, we take a holistic approach to parking. Planner Jeff Speck outlines such an approach in his book Walkable City: How Downtown Can Save America One Step at a Time, an essential (and brisk) read for anyone interested in revitalizing his or her community. Actually, Speck’s approach to parking made me reconsider most of my philosophy about the role cars play in walkable, mixed-use districts. Speck’s third step in his 10-step method to creating walkable places is “Get the Parking Right.” This section is a lot about the real costs of parking and the fact that in most places, it is created on a massive scale at great expense and then offered to users for free. Parking, Speck concludes, should be priced in a way that is responsive to demand. On-street spaces close to stores are more in demand and should carry a premium price. This ensures a frequent turnover in spaces that are closest to businesses’ front doors. Those who don’t want to pay the higher price could park in a shared public lot, which is often less convenient, and pay a lower rate. Free off-street parking and a drive-thru. A double-whammy against walkability. Those who prefer none of the paid options can choose to walk, bike or take public transit. Meanwhile, our zoning code should be changed so that developers and businesses are not required to provide off-street parking, allowing them to create more space for the services that actually bring in money. Instead, developers interested in offering some parking for businesses can pay a fee that supports those shared municipal lots. Those shared lots should be as unobtrusive to the public realm as possible. While underground parking is nice, it’s also expensive to build. Shared lots should either be located behind buildings or interspersed within the neighborhood. 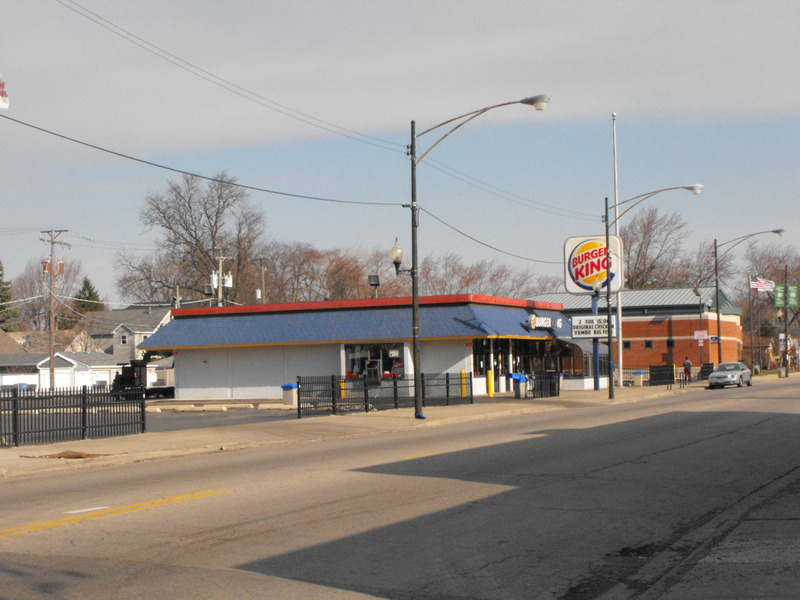 Even highly-walkable Lincoln Square has public lots, but they are by no means the dominant sights in the neighborhood. A lot of this seems counterintuitive, but Speck cites case studies in which charging for parking actually had the desired effect: More walking and more business activity. In Pasadena, Calif., for example, parking meters were installed downtown, and sales tax revenue soared. By taking an holistic approach to how parking is provided — and recognizing that parking is just one part of making a place successful — cities have been able to address both perceived parking problems and walkability problems. In the Beverly area, we could learn a lot if we really take a hard look at the parking we have and what it accomplishes, and then consider how to move forward in a way that enhances the pedestrian experience and improves the condition of our business districts.